I’m not an attention seeker. But last weekend, I did something conspicuous. 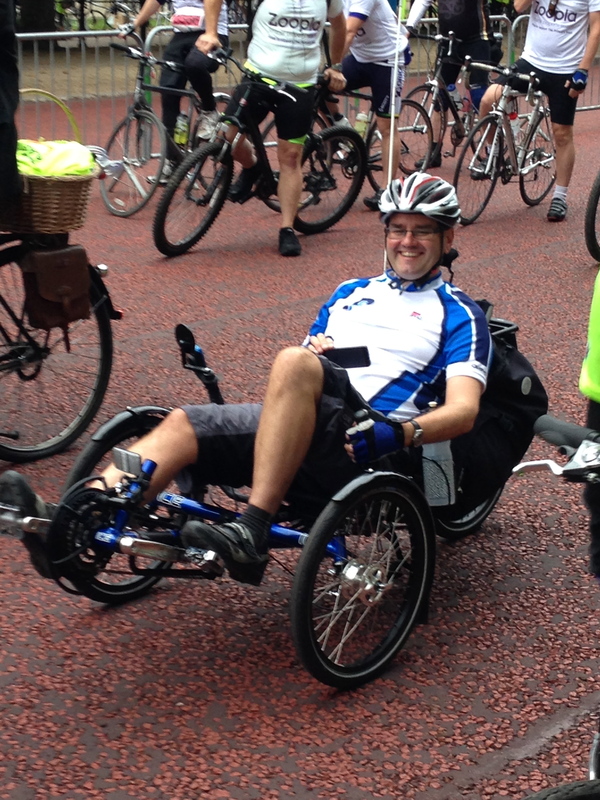 I rode an ICE Adventure recumbent tricycle on the 45 mile Palace to Palace bike ride for the Prince’s Trust. I was, as far as I could see, the only person on three wheels rather than two. It was the trike’s first big outing, and it was a revelation. During the countless traffic lights between the start in The Mall and Richmond Park I relaxed in my comfortable seat, feet still clipped into the pedals, ready for the lights to change. By contrast, everyone else was clipping and unclipping. The Adventure was as fast on the flat as I’d been told to expect. I loved (carefully) overtaking groups of cyclists on the trike, seeing their surprise and delight at the unlikely vehicle passing them. My trike is long. And big. Yet I can get it in the back of my MINI, thanks to the amazing compact flat twist fold. 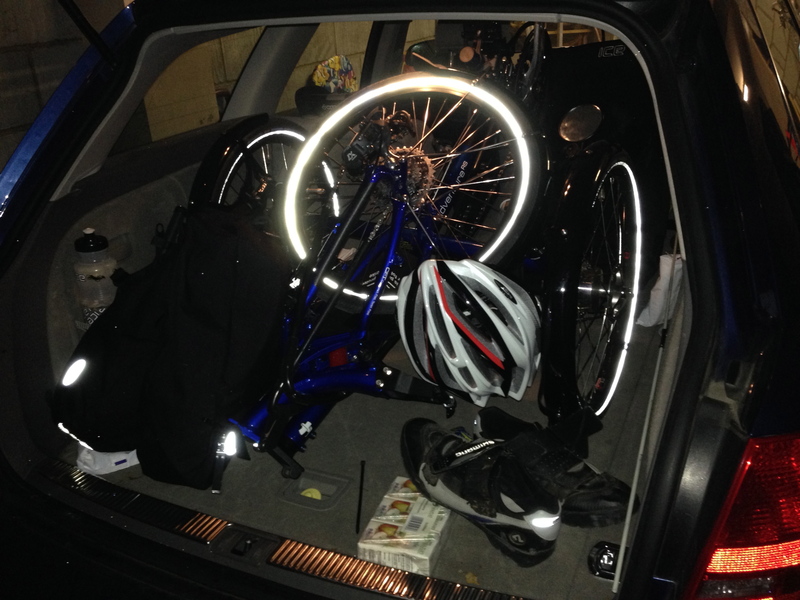 The rear wheel folds into place between the front wheels after you’ve taken off the seat. It meant Karen could take me to London for the start in our estate car (above), and meet me in Windsor. Above: ready to ride to the start! As I said at the start, there’s no hiding place on a trike. 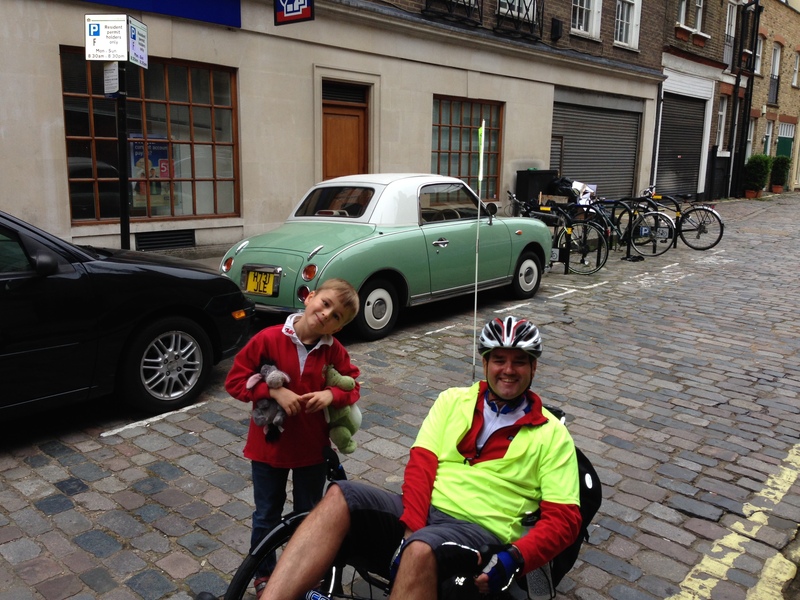 Children and adults smiled and said, “Cool!” – referring to the trike, not me! And I couldn’t help smiling as I steered it like the go-kart I loved as an 11 year old growing up in Cardiff. Windsor is a wonderful destination for a bike ride. It’s got everything: history, the largest castle in Europe, the royal connection, the Thames and lovely cafes and restaurants. It was a special moment as I crossed the finishing line at Windsor Racecourse. Finally, the whole point of this ride was raising money for the Prince’s Trust, a worthy cause that helps disadvantaged young people make the most of their potential. The Trust did a brilliant job organising the event, with superb organisation, signposting and marshalling, and a great welcome village at Windsor. I was lucky enough to be part of the PayPal UK team riding Palace to Palace. I’m pleased and grateful that friends and family have helped me raise over £600. If you’re feeling generous and charitable, I’d be delighted if you added to my total. You can do so here. Thank you! This entry was posted in Cycling and tagged ICE Adventure, Inspired Cycle Engineering, Palace to Palace, Prince's Trust by Rob Skinner. Bookmark the permalink. Mum and really enjoyed that. And the pictures. Amazing how you could get it into the mini.